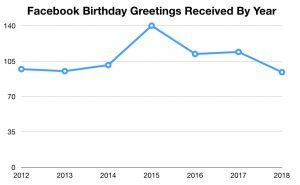 Do Facebook Birthday Posts Affect Popularity? I have a confession to make: Three years ago I stopped wishing people happy birthday on Facebook. It’s a scam to encourage “engagement” and it feels like a cheapening of the personal connections a friend’s birthday celebration should be. And yet, every mid-June I get a micro-dose to my ego as I count up the number of greetings I get on my own Big Day, even though in recent years the number of greetings has incrementally gone down since I stopped posting Facebook Birthday Greetings (FBDG). Each year, I wonder: am I getting fewer birthday greetings than the year before because I’m not reciprocating? And, how many people are hitting me with automatic birthday greeting scripts? Raising the Facebook popularity stakes even more: I’ve begun to wonder that since I stopped posting FBDG, has this impacted the number of people who “like” cute pictures of my son or witty comments? After a brief perk up in 2015, my numbers have dropped over the years from 140 to 94, even though my number of overall Facebook “friends” has remained the same. The attached graphic tells the whole story. I’m not a terrible person. I still wish people happy birthday. I just do it with a phone call, a text or now and then, a heartfelt email. 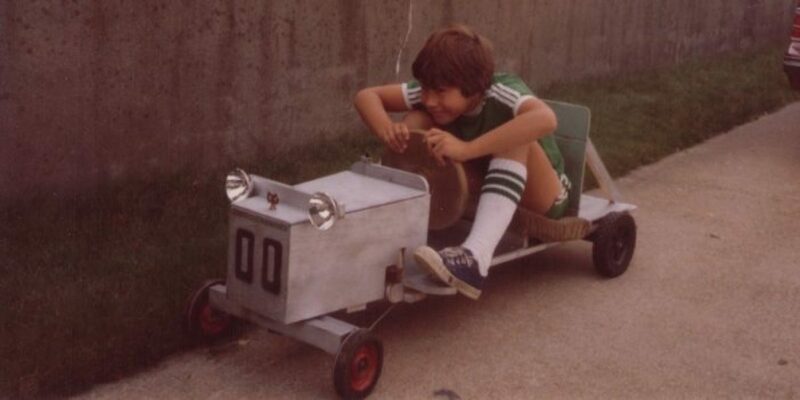 It takes a lot more effort and I can impact a much smaller group of people, but I’m not commoditizing birthdays any more. If you hear from me, its because I had to make an effort. Americans are spending an average of 50 minutes a day on Facebook. An incredible amount, and yet, I’m betting that most of you reading this post are even more “consumption heavy” and are probably pushing two hours a day. Facebook has become the center of our lives, whether we like it or not, and it’s changing our habits. Publishers, who once made a killing on time-killing devices known as magazines and newspapers, have found once-idle audiences are now occupied with Facebook, rather than their products. We define “friend” much more loosely now that we have hundreds or even thousands of people we follow and have incremental interactions with. And citizens around the world use Facebook for political organizing, rapidly accelerating the speed at which anti-government protests come together. But most of all, it has made us worry about popularity, and whether or not people really “like” us. The dystopian sci-fi Netflix show “Black Mirror” summed up all Facebook fears with its “Nosedive” episode, where social media popularity rankings totally governed one’s success in life. While we’re far from this sort of thing happening, my drop in FBDG greetings certainly makes me think about it. 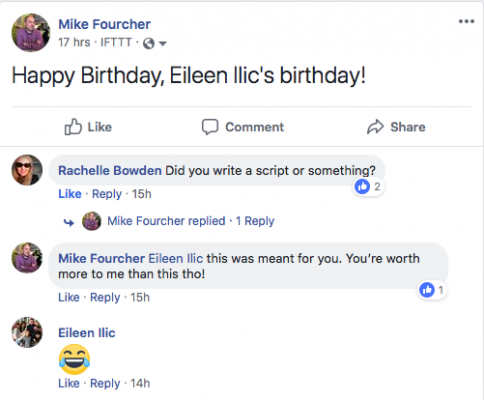 Yesterday, I started an experiment with an automatic posting script to post birthday greetings for every one of my Facebook friends. Unfortunately, it didn’t work (see the result below). Other systems I’ve found that work as Facebook apps scrape up too much of mine and my friend’s user data (no doubt a honeypot scheme to collect social graph data), so I’m going to skip the automated system and do it manually. I’ll keep at it for a year, and then see if my greetings numbers pop back up. I’ll let you know next July how things worked out.